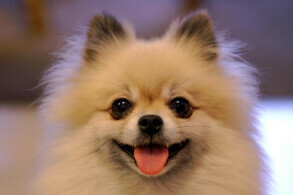 The pomeranian is very popular a toy dog breed known for their big personality, boldness, and furry coats. The breed is intelligent, but can be a bit stubborn which can make them more difficult to train than other intelligent dog breeds. 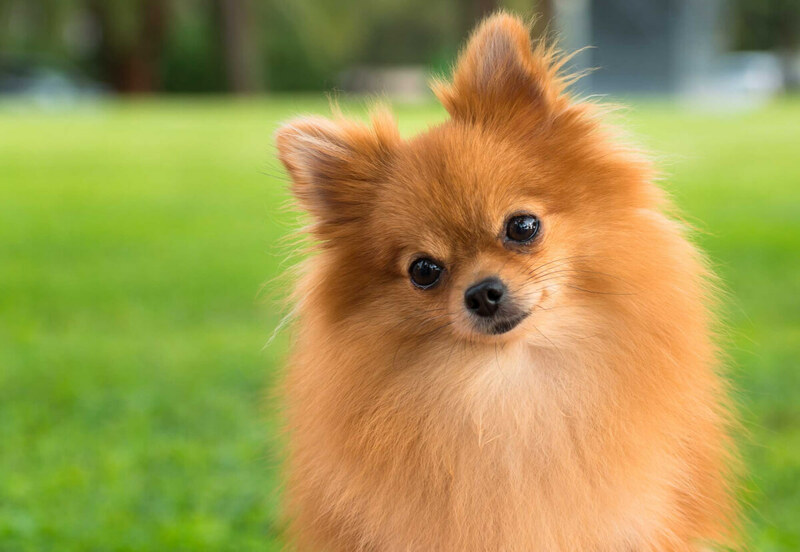 Unlike other toy dog breeds, pomeranians are not dependent on being with their owners and don't suffer from separation anxiety. Its not uncommon to see these dogs being used for therapy due to their small size and overzealous attitude. The pomeranian is an alert dog breed that will alert their family of any unusual activity or strangers which makes them a good watchdog breed. 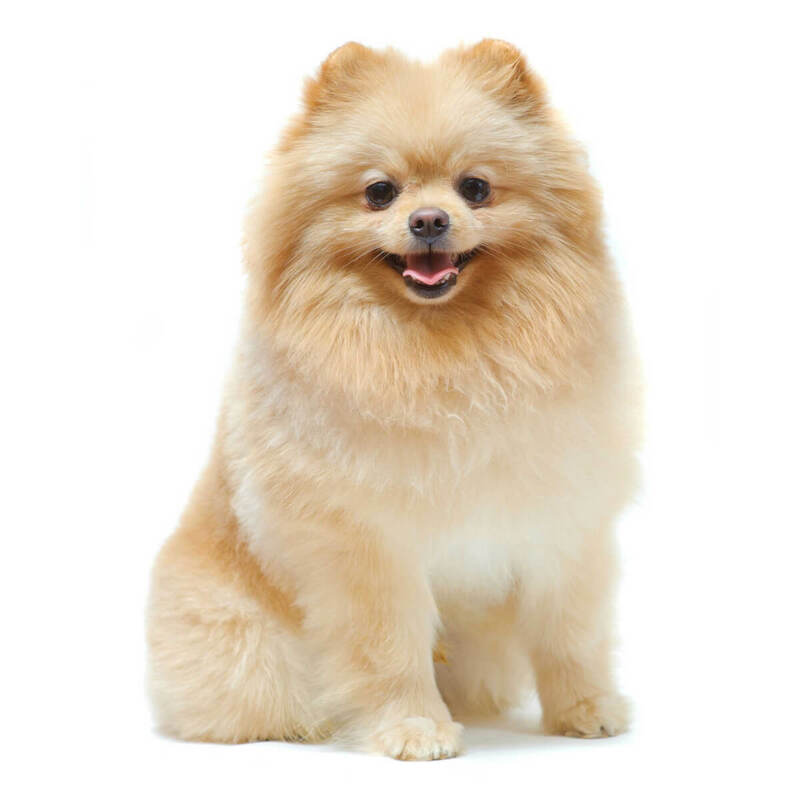 Below are the characteristics and traits of the pomeranian dog breed. 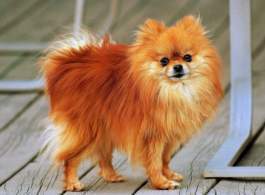 Pomeranians are among the smallest dog breeds. With poms being as small as 7 inches tall and weighing as little as 3 pounds, they are easily classified as a toy dog breed. Because of their small size they are not recommended to be outdoor dogs (or to go outside unsupervised) as they can become prey of larger animals like birds. 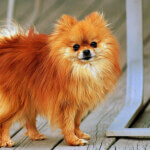 The pomeranians small size makes them a perfect apartment dog and a travel companion. 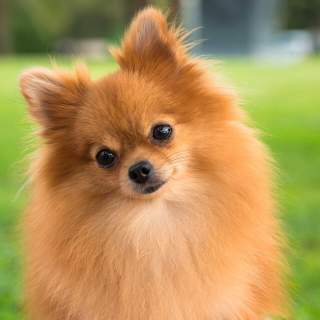 Pomeranians are very alert dogs and make excellent watchdogs, however they can develop barking tendencies so it's recommended to train them at an early age to only bark when necessary. They love to play and are excellent with children that can play gently with the small dog as the pomeranian can easily get hurt due to their small size. Poms do well with other smaller pets, but they should be monitored when around larger dogs as they can become dominant and harass the larger dog. 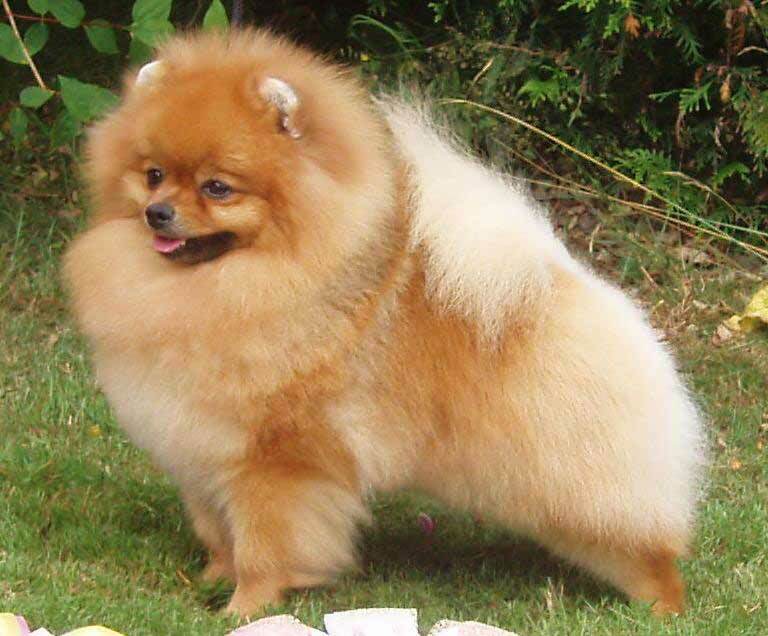 The Pomeranian is known for their thick, fluffy, and soft coat. The hair is generally puffed out which adds to the pomeranian's proud appearance. Although they have furry appearances, they are only moderate shedders. Weekly brushing and bathing as necessary is generally all that's needed to keep the breed groomed and maintained. Most people probably wouldn't believe the origin of the Pomeranian. These little fluff balls originally came from much larger Arctic sled dogs. Their most direct descendent, however, is said to be the German Spitz —a dog that looks very unlike the modern-day Pom. They got their name from Pomerania, which no longer exists as a nation but was in the northern regions of Germany and Poland. While the Pom didn't actually originate there, significant breeding contributions were made in the area. The most important one was the first downsizing of the breed toward its present size. While there were few documents regarding the dog's development, one of the earliest known references was in the 1760s. A diary entry in a book that remained in print until the 1950s, "Boswell on the Grand Tour: Germany and Switzerland 1764," told of this breed: "The Frenchman had a Pomeranian dog named Pomer whom he was mighty fond of." There was also Carl Linnaeus, a naturalist from Sweden. During the mid- to late-18th century, he classified many dog breeds. In his books and papers, he mentions the Canis Pomeranus and its history. It wasn't until the 1870s, when Pomeranians were exported to England, that the breed became widely known and carefully documented. The Kennel Club, in England, was the turning point in the dog's popularity. The breed was formally recognized in 1870. In the 1880s, medium-sized Pomeranians were exported to the United States and entered increasingly in dog shows. By 1891, the first breed club was set up. The following year, the American Kennel Club (AKC) allowed the Pom to be entered under its Miscellaneous Classification. Two years later, in 1900, the AKC gave the breed its formal classification. These days, Pomeranians are extremely popular and are often in the winning lineups at the biggest dog shows. 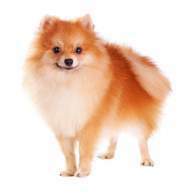 They are also now included in the breed standard of the German Spitz. Pomeranian pies, as the puppies are sometimes called, are easily one of the cutest dogs ever! (The word "pies" is Polish for "dog.") 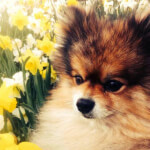 Poms, whether as a puppy or an adult, are small, have features which can be made to look very different from one dog to the next. Still, they are instantly recognizable no matter the size, coat style, or fur color. The dog's distinctive fox face makes it clear that the breed's ancestry is from the Spitz world. The muzzle is medium in length but very pointed and sticks out from the round, dome-shaped head. On top are perky, triangular ears. The small neck has hair shorter than the rest of the body, and the body is small but sturdy. They should have a scissors bite, but they may have an overbite or even a slight underbite. They stand on very short legs with small paws. The tail, which is feathered, curls up over the dog's back. The coat is what makes them so cuddly. It has two layers and depending on how the owner styles it, can be either fluffy or straight. The Pom comes in a great variety of colors. Some are apparently even invented for the sundry shades of these world-famous dogs! There are some rare colors, and sometimes colors are made to match the size, such as toy, mini, teacup, etc. Full-grown males and females alike have a basic height of about 7 to 12 inches. Their weight ranges from 3 pounds up to 7 pounds. There is an obsession over both 5 pound Poms and 10 pound Poms. (You should know that, when they are puppies, any dog is impossible to predict for its adult size.) There are those that harken back to their ancestral size and can get big. They might get up to about 14 pounds! A Pom that weighs more than 14 pounds is called a "throwback Pomeranian." Breeders continue to downsize these dogs to such a point as to be unhealthy, however. The toys, teacups, miniatures (or mini) and other tiny Poms are very popular. It seems the smaller they are, the bigger the price. There are two types of variations with Pomeranians: the face and the size. Neither type of variety is formally acknowledged, and both present their own problems. Of the three face varietals, only one is semi-official by AKC and other renowned kennel clubs: the fox face. This is because the breed standard calls for this kind of face, and as such, it's implicitly acknowledged. By proxy, this implies that there are non-fox faced Pomeranians. Still, that doesn't mean the other two kinds of Poms are equally acknowledged. These two other types, the "teddy bear" and the "baby doll," are most likely marketing terms. One of them is even the same as a typical dog hair cut, and this " teddy bear face" can actually be styled by a groomer! If you're curious about coat varieties, there are none with the Pom breed. You may hear or see of a Pom called a Teddy Bear Pom because of the coat styling, but this is not a true style but a grooming feature. When it comes to size variations, Poms are already a Toy breed. This means that the typical size variety names can be confusing. Some backyard breeders (BYBs) will label their puppies "Toy Poms," and this is simply silly as all Poms are Toys. Then there are the so-called miniatures (or mini), micro, teacup, boo, pocket, etc. These dogs tend to have a great many serious health problems due to downsizing that harms the dog, or because runts are used for breeding even smaller dogs. 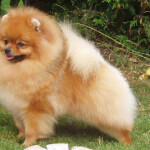 Another serious problem is when dwarfism is ignored and the dogs are used to breed ever-smaller Pomeranians. 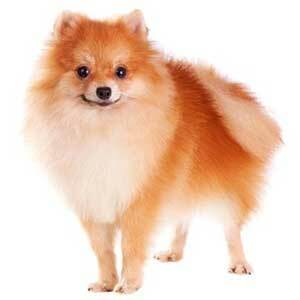 Sometimes called the spitz nain pomeranien, such dogs are to be avoided. The Pomeranian temperament makes for bold dogs who can be stand-offish with strangers. They won't hesitate to demand what's going on regardless of how much they know any given person. With those they love, they'll also be playful, attentive, and eager to challenge you in an adventurous way. With those they've yet to know, they'll want to know them — but on Pom terms! It's simply one of the characteristics bred into them a long time ago. As puppies, they tend to be extremely extroverted. This can make it difficult to find that middle-of-the-road personality. While these are wonderful traits to the Pomeranian personality, it also means that training can be difficult. There are tricks, however, and while snacks are one such trick to get them to train, their love for attention tends to be a better one. They are very vocal dogs, and you should learn about their various types of yapping. Anyone who's never been around a Pom might venture to ask such questions as, Are Pomeranians good with babies? Are Pomeranians good with children? Anyone who has lived with these dogs will often, almost unhesitatingly say, Um…no. Toddlers and very young kids can treat dogs like toys, and this particular dog is highly intolerant of such behavior. While they can be trained to be OK and even good family dogs, Poms won't put up with much, if anything. Pulling tails, tugging hair, and running about are things that can easily set them off and prompt them to defend themselves in a no-means-no manner. If you are looking to raise kids and have Pomeranians, you will need to train the child (or children) as well as the dog. When it comes to Pomeranians and cats, the sky's the limit — and it all depends on you. If they grow up together, chances are good that a Pomeranian with cats will work out. If one or the other is introduced to the home as an adult, there is sure to be some difficult training sessions ahead to prevent future strained relationships. 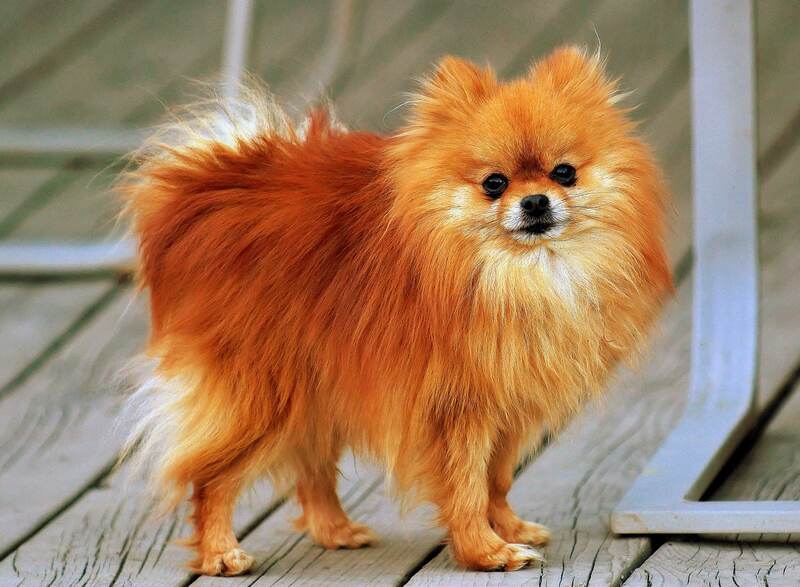 With other dogs, Poms can be aggressive, often because of size. The bigger another dog is, it's believed, the more ferocious Pomeranians tend to behave toward them. With proper and patient training, however, this can be prevented or perhaps even undone. If your Pom grows up with non-Pom puppies, this should make life easier. 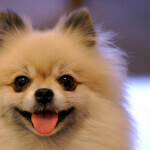 Below are pictures of the Pomeranian dog breed. Although these dogs were initially bred to spend a lot of time outdoors as four-legged alarm bells, they've been pampered for a few centuries now. They prefer to spend most of their time indoors. They are fine in small apartments but do much better in big houses where there is a lot to explore. The significant dander generated by this breed's thick, double-layer coat makes these dogs decidedly not hypoallergenic. Be prepared to spend a lot of time grooming, cleaning, and dealing with allergies if you are thinking about owning a Pomeranian. Queen Victoria was perhaps the then-most famous person to own a Pomeranian. Albert Einstein was another celebrity, although his fame didn't come until much later. These days, it's not so much the owner as it is the dog that has become the celebrity. The World Wide Web has launched the career of many a Pomeranian — and her parents! 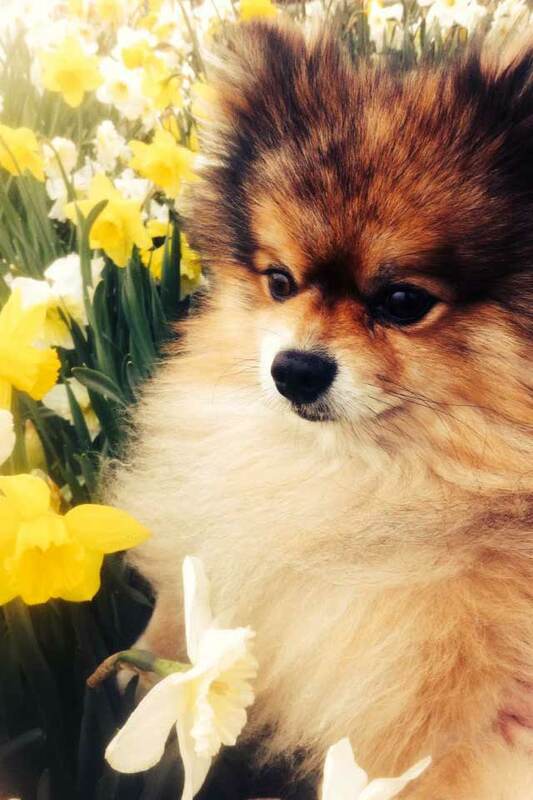 A few of the better known online Poms are Jiff the Pomeranian, Shunsuke, Flint the Pom who is up-and-coming, Roux (who has a sneeze heard round the world! ), Charlie, and Benny. There is also, of course, the recently deceased Boo the Pomeranian dog. It is said that he had more than 16 million Facebook, Instagram, Twitter, and other online followers! On the other side of the coin are the ugly Poms, which are not to be confused with the Pomeranian ugly stage. While there is great fun online to be had with the ugly Poms that are simply cute in a different way, the ugly Pom puppy stage is one that many people deal with. It's the stage when the puppy's soft, downy, single-layer coat transitions to the adult coat of two layers. Like an adolescent kid who may have odd parts of his or her body grow while others wait, this stage in the Pom's development can make the dogs appear ugly. It almost always passes, however, and when the mature coat is fully grown in, cuteness should return! All small dogs, no matter how robust their health profile, have some problems. While many people will say that you'll rarely need to go to a vet with a properly fed, exercised and loved Pom, there are still some things that can happen. The worst health problem with this breed tends to be the dental issues they have. It may be difficult to maintain, but regular brushing and mouth care will go a long way with these fiesta little dogs. The typical Pomeranian's average life span is anywhere from 12 to 16 years.